ASU's Jordan Bachynski (left) pumps his fist after he was fouled by Utah's Dallin Bachynski during the second half Thursday in Tempe, Ariz. The Sun Devils defeated Utah 79-75. TEMPE, Ariz. — Jahii Carson scored 23 points, eight in a decisive five-minute span late in the game, as Arizona State held on to beat Utah 79-75 on Thursday night. Jonathan Gilling added 13 points, including 3 of 3 3-pointers, a critical one coming with 1:40 to play for the Sun Devils (14-5, 3-3 Pac-12). Jordan Bachynski had 11 points and 12 rebounds for Arizona State. Jordan Loveridge scored 22 points and Delon Wright 21 for the Utes (14-5, 3-4), who led by as many as nine in the first half and were up 41-37 at the break. Shaquielle McKissic added 11 points for Arizona State, which had lost two in a row. Dakarai Tucker’s 3-pointer gave Utah its last lead, 61-60, with 7:32 to go. Carson’s 10-footer 17 seconds later put the Sun Devils up for good, 62-61. Bachynski’s fastbreak layup made it 64-61. Three times, Utah cut the lead to one only to have Arizona State respond. Carson’s driving layup with 2:32 to play put Arizona State up 70-67, then Gilling’s 3-pointer made it 73-67 with 1:40 left. Bachynski’s two free throws boosted the Sun Devils’ lead to 75-67 1:22 from the finish. After missing three of four free throws, Arizona State finally put it away when Jermaine Marshall made three of four at the foul line. Arizona State got a strong game from seldom-used Bo Barnes, who scored nine points, including a pair of 3s. Utah, coming off home victories over UCLA and Southern California, used a 9-0 run to go up 28-19 on Loveridge’s 3-pointer with 8:10 left in the half. 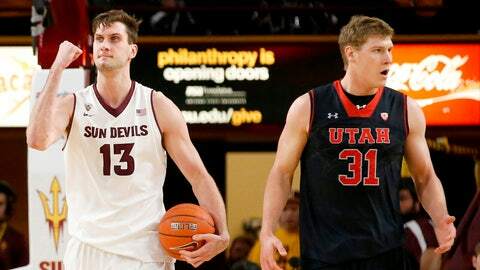 Carson brought the Sun Devils back, scoring seven points in a 10-2 spurt that cut the lead to 34-33 on Gilling’s 3-pointer 3:50 before the break. But Wright’s three-point play, followed by Loveridge’s 15-footer boosted it to 39-33. McKissic’s baseline jumper at the buzzer cut Utah’s lead to 41-37 at the half. Arizona State took its first lead since the opening minutes, 46-45 on Bachynski’s two free throws with 6:33 to play. But Loveridge responded with a 3-pointer and Utah was on top 48-46. Gilling’s 3 put the Sun Devils up 50-49, triggering a 7-0 surge that had Arizona State ahead 54-49 when Brandan Kearney scored with 12:58 left. Utah managed one final surge before the Sun Devils pulled away for good. Bachynski’s younger brother Dallin scored five points for Utah.